Product prices and availability are accurate as of 2019-04-21 06:18:16 EDT and are subject to change. Any price and availability information displayed on http://www.amazon.com/ at the time of purchase will apply to the purchase of this product. Thermco's precision refrigeration thermometer is encased in a water-tight, shock-proof plastic case and can easily be mounted in a vertical or horizontal orientation. The built-in cylindrical lens allows for an optically widended scale and easy reading. Simple mounting by the use of 2 sturdy holders, which themselves are adjustable, depending on the mounting requirements of the refrigerated installation or freezer (see technical drawings). Position of thermometers may be from vertical to horizontal. (They must not be tilted upside down, however). Shock-proof plastic case with special resistance against acids, alkali and rooms with aggressive air. 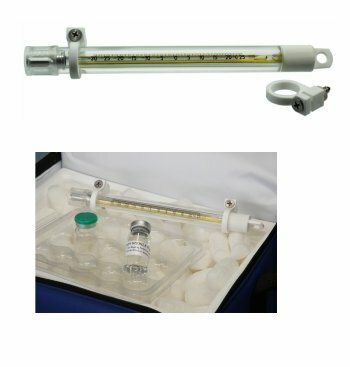 Total impact protection of the liquid-in-glass thermometer because of compact mounting. Water-tight, thus also usable in open-air installations. Easy reading and optically widened scale because of built-in cylindrical lens . Hard to break even when handled roughly. Acid- and alkali- resident graduation and lettering of scale, which forms and integral part of the glass and is practically indelible Constantly high accuracy of temperature indication and durability because of aging. Temperature indication is effected without use of further devices or energy sources, which makes the instrument wear resistant.